In August 1996, a group of scientists announced that they had found evidence of ancient life on Mars. This evidence included bacteria-shaped objects and organic chemical molecules in the martian meteorite ALH 84001, which was collected in Antarctica. In the next few days, NASA presented the work at a press conference, the President made a statement about it, and the TV and papers were full of reports, speculation, and jokes about life on Mars. 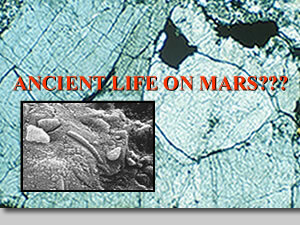 Most of the world was unprepared for possible traces of martian life in a meteorite. Collecting meteorites in Antarctica was novel; the idea of martian meteorites was bizarre; knowledge of Mars was sketchy; and knowledge of primitive life on Earth was limited. Much of the important information is hidden in technical journals, written by specialists for specialists. With this slide set, we hope to make some of this information accessible. The slide set and captions are divided into sections on Mars, Antarctic meteorites, ALH 84001 and its possible traces of life, and exploration of Mars and the universe. Most slides and captions can also be used independently. Terms defined in the glossary are underlined the first time they are mentioned in this booklet. The suggested reading portion of this slide set has been updated to include research published since the time of the first edition, and some of the captions have been updated to reflect the success of recent missions. Mars is the fourth planet from the Sun, and is the outermost of the “terrestrial” (Earth-like, or rocky) planets. It is the second closest planet to Earth. With a diameter of 6788 kilometers, Mars is about half the size of the Earth. Its elliptical orbit, thin atmosphere, and lack of an ocean give it an extraordinarily wide range of surface temperatures. Near the equator, high temperatures can reach 22°C (72°F) in summer; at the south pole in the dead of winter, lows can be -125°C (-255°F). The surface area of Mars is equivalent to the land area of Earth. Mars appears reddish because much of it is coated with iron oxide minerals (the material that forms rust on Earth). Its atmosphere, composed primarily of carbon dioxide, is very thin. Air pressure at the planet's surface is about one two-hundredth of the air pressure on Earth. As on Earth, clouds form and dissipate each day (one Mars day, called a “sol,” is 24 hours and 37 minutes long), and the global atmospheric circulation is driven by seasonal changes in temperature. Occasionally, winds raise dust storms. These are usually short-lived and local, but can grow to global proportions (most frequently when Mars is closest to the Sun). Mars' geologic history has been much simpler than the Earth's, mostly because Mars is smaller than Earth. Mars' smaller size — approximately one-half the diameter of Earth-- means that Mars loses its internal heat much faster than Earth does. Because internal heat powers geological activity on a planet, Mars now has much less activity, like volcanos and earthquakes, than Earth. Its lower gravity — approximately a third of Earth’s — allows water in its atmosphere to escape to space, so the martian surface has become desiccated over time; once it had abundant water, but now it is drier than the most arid desert on Earth. In the late nineteenth and early twentieth centuries, some astronomers looked at Mars through telescopes and saw dark linear features that changed seasonally. Percival Lowell championed the idea that these lines were canals cut by intelligent Martians, and his ideas were popular (though controversial) through the middle of this century. The Mariner spacecraft destroyed Lowell’s vision of intelligent Martians when they sent back images of an arid, ancient Mars, without any sign of life or its works. However, scientists still thought that Mars was the most likely place to find life in the solar system. This is why the Viking landers to Mars came to carry three instrument sets to search for signs of life: cameras, a gas chromatograph and mass spectrometer, and a biology metabolism package. None of these instruments found clear signs of life on Mars. The results were discouraging. The Viking cameras and the biology experiments revealed an arid, lifeless desert. However, continued studies of Mars and a growing understanding of how Mars has changed over time led many scientists to believe that Mars once had the ingredients for life — an abundance of water, an atmosphere as thick as Earth's, and a warmer climate. Perhaps when the atmosphere and water were lost, martian life moved underground. The challenge for our future is to look for signs of life from that earlier, more hospitable time, and to look for signs of recent life (or living organisms) wherever they may be — most likely in wet places underground, away from Mars’ harsh surface. We are pleased to acknowledge the assistance of Nadine Barlow, Adolphus Bischoff, Geoffrey Briggs, Michael Carroll, Julius Dasch, Marilyn Lindstrom, David McKay, Pat Rawlings, R. William Schopf, and Michael Zolensky, who helped in the speedy assembly of images and data for this slide set. Our thanks also to the staff of the Lunar and Planetary Institute for their work in image processing, editing, and production.